'Oriented toward gregorian chant’? What does this phrase mean? It’s so beautiful, I could faint! This will surely be your response if you should want to visit the website of Corpus Christi Watershed (http://www.ccwatershed.org/blog/categories/loft/). The music is not Gregorian chant but contemporary sacred music composed in a way that is oriented toward the chant. Http://www.chantcafe.com/ and http://www.newliturgicalmovement.org are two other websites filled with information about beautiful liturgical music and ways to make it available to parish communities. Here you will find many links to composers, who, for years, have been inspired by the Church’s ideal of bringing to the faithful beautiful sacred music that is easy to sing and music that is synonymous with prayer. Much has been written about the phrase, ‘oriented toward Gregorian chant,’ but it calls for explanation. To begin with, music of the liturgy must sound different from street music, music of a rock concert, music sung in a discotheque, or music for the movies. It differs from the sounds typically associated with romantic music. It is prayer that is sung, prayer that bears the imprint of silence. Orientation toward Gregorian chant involves melody, rhythm, types of sound and harmonization. Melody. Melodies based on the chant paradigm have the following characteristics. First, the melody moves up or down in stepwise fashion. It has almost no skips wider than a third. Second, if intervals wider than a third are used to intensify a text, they are followed by a stepwise ascent or descent. A wide ascending interval of a fifth is followed by a descent in scale wise fashion; a wide descending interval of a fifth is followed by an ascent in scale fashion. This melodic structure was almost always followed by J. S. Bach. The profile of a melodic line looks like a gentle wave. Melodies sung with affectation or idiosyncratic mannerism do not comport with the orientation toward Gregorian chant. Rhythm. Rhythm based on the chant paradigm is flexible and lacks the vertical beat, for example, 1-2; 1-2-3; 1-2-3-4; 1-2-3 4-5-6. These accents fall vertically on the first beat; or, if not, on a syncopated beat, similar to jazz. Jerky, heavy, frenzied rhythms found in popular culture do not comport with the orientation toward Gregorian chant. The rhythm that most resembles Gregorian chant is the pattern of the rise and fall of gentle waves. The beat or tactus rises and falls and moves directionally but without an accented up-down beat. Sound. The voice is the natural instrument that expresses the sentiments of the heart more meaningfully than a musical instrument. The organ, the king of all instruments is preferred if it lightly supports the voices. Brass instruments which, by their very nature, claim prominence, should be used sparingly or for special occasions. Neither they nor any musical instrument should overpower the voices. In the Mass of the Resurrection by Randall DeBruyn, the brass instruments overpower the voices with their percussive noisy sound making it an unsuitable Mass setting. Harmony. Most chant is monophonic, sung without instrumentation. But some chants lend themselves to harmony. Today, even Gregorian chant has been put to simple harmony. Harmonies should not resemble the complex contrapuntal style that was banned at the time of the Counter-Reformation. In conclusion, the music oriented toward Gregorian chant is music that has been pared down and purified from the secular sound. Today, no one would advocate that Gregorian chant be the only music sung in parish communities. Let us hope that cloistered monasteries allow its 3,000 or more melodies to flourish for the sake of their guests and for the ages. The continuity of the Church’s musical treasury does not merely reclaim the past without also welcoming contemporary music that bears the imprint of the otherworldly. There is a renewed emphasis in two main directions, both essential to the full participation of the faithful in the Mass. First, we are witnessing a renewal in singing the Mass. This means singing the Ordinary parts: Kyrie, Gloria, Sanctus, and the Agnus Dei. There are eighteen Mass settings of Gregorian chant Ordinaries in the Liber Usualis, the liturgical book containing the complete Latin settings of Gregorian chant for every Mass of the year. The easiest Mass settings are Mass XVI and Mass XVIII which can be sung during Lent and Advent. Second, there is a renewed interest in singing the Proper (changeable) parts of the Mass in English because of the rich texts from the Old and New Testaments. Post-conciliar years saw many parishes drop the prescribed Proper parts of the Mass: the Entrance or Introit, the Gradual, the Communion. If you wish to hear music whose orientation closely aligns with that of Gregorian chant, you can find it in the music of Kevin Allen, Fr. Samuel Weber Bruce E. Ford, Jeff Ostrowski, Aristotle A. Esguerra, Adam Bartlett, Arlene Oost-Zinner, Brian Michael Page, Richard Rice, Ian Williams, Kathy Pluth, David Frill, Chris Mueller, Richard Clark, Noel Jones, Charles Culbreth, Jacob Brancke, and other composers. Their music is modern, accessible, and beautiful. Dr. Peter Latona of the Basilica of the Immaculate Conception is not only a fine composer but directs the choir there. He recently conducted a concert as a tribute to Benedict XVI entitled appropriately, “Truth and Beauty.” The music, composed from various periods including contemporary, was captivating. The music of Taizé has become a universal phenomenon. This French ecumenical monastic community, attracting youth from across the globe, has created music of silence and mesmerizes those who chant it – or rather, pray it. Take for example, perhapsthe most famous chant, “Jesus, remember me when you come into your kingdom.” It is appropriately sung on Good Friday at the Liturgy of the Pre-Sanctified. Another is “Stay here, remain with me, watch and pray.” This is music with free rhythm. One could say that they are at the top of the ‘hymn parade’ of Holy Week sacred music. The psalm settings of Father Joseph Gelineau, S.J. express a crystalline purity that is sheer beauty, if sung properly. The music of Richard Proux deserves mention here as well for his lovely revision of The Community Mass. All suitable church music – polyphony, motets, Protestant Psalter and hymn-tunes have found ways of adapting their own styles to plainchant’s melodies and rhythms. The sacred music of the Elizabethan and Anglican School, of Ukraine and Russia, Reformed Protestant hymnody, and many contemporary composers also belong to the Church’s broadened treasury because their structure resembles that of Gregorian chant. There is the classic Protestant hymn, “Old One Hundredth,” “For All the Saints,” “Lift High the Cross.” One secular, stately, and beautiful melody has become part of the sacred repertory. Embedded in the composition, “The Planets: Jupiter” and composed in 1920 by Gustav Holst, “Thaxted” is one of our best-loved hymns. Many texts have been set to this melody, among which are “O God, Beyond All Telling” and “O Spirit All-Embracing.” The melody was sung in 1997 at the funeral of Diana, Princess of Wales. Today there are more composers of beautiful sacred choral music than there are those who write in the ‘folk’ – and popular style. Gregorian chant has influenced many composers. Some of our senior composers are David Wilcox, Lucien Deiss, Leo Sowerby, Noël Goemanne, Flor Peters, and Healy Willan. JohnTavener and Arvo Pärt have based almost all their compositions on plainchant. There is a growing revulsion among pastors, clergy, and laity at the use of missalettes to which most parishes subscribe. More and more, they see them as a bad investment, a waste of parish funds, already stretched to the limit. These flimsy, disposable paperbacks must be changed a few times a year for the entire parish community. The cost is prohibitive. These shabby, unattractive throw-aways with God’s word printed between the covers would make a rabbi gasp in disbelief, for the Torah is encased in precious jewels. So too is the book of the Gospels in the Christian East. In the Roman Rite, the Sacramentary and Lectionary are reasonably attractive books. What image does a missalette project? Texts are printed on cheap paper, and most music is unsuitable for worship. “We are teaching ugliness to our Catholics,” writes Alice von Hildebrand, dismayed. Why shouldn’t the faithful hold in their hands a beautifully-bound book containing the word of God from which to sing? 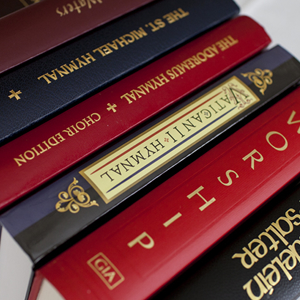 The Vatican II Hymnal is the first hymnal since the Second Vatican Council to include the texts of the sung Propers for every Sunday and major feast. A newly-minted missal, it is beautiful to look at with beautiful music notated within. A parish community can feel proud to hold this splendid example of the Church’s treasury of sacred music, both traditional and contemporary. The paper is of the highest quality with a resilient binding, the designs, beautifully appointed. It has the readings for all Sundays and feast days – the complete cycles, A, B,C. It will be about twenty years or perhaps thirty before another translation is made. Here is music for the new evangelization. Vatican II Hymnal serves as a musical ambassador for Christ. Some years ago, while making a pilgrimage to some religious sites in Annecy, France and its environs, I had the opportunity of worshiping on Sundays at the village church in the Grand Bornand, high in the French Alps. There the parishioners sang the Sunday liturgy – the complete Ordinary, Kyrie, Gloria, Credo, Sanctus, and Agnus Dei accompanied by a small organ. The schola, about ten in number, sang the Proper parts. At the Communion rite, the faithful sang local hymns. Little did they realize that an American Catholic found the experience unforgettably beautiful. Sr. Joan L. Roccasalvo, a member of the Congregation of St. Joseph, Brentwood, NY, holds degrees in philosophy (Ph.L), musicology (Ph.D.), theology (M.A. ), and liturgical studies (Ph.D). She has taught at all levels of Catholic education and writes with a particular focus on a theology of beauty and the sacred arts. Her e-mail address is jroccasalvo@optonline.net.